Several bars in downtown Reykjavík ran out of beer while serving thirsty US sailors and marines who were in port over the weekend participating in the NATO military exercises Trident Juncture. The restaurant Sæta Svínið, The American Bar and other downtown bars reportedly finished all their beer supplies serving the 6-7,000 sailors who were in town. The local news site Vísir reports that the brewery Ölgerð Egils Skallagrímssonar, which makes the popular Gull, had to send out emergency supplies to the bars. According to the sources of Vísir the soldiers preferred local beers over imports, and were very willing to sample different micro brews as well as the more popular standard lagers. The local blogger Eiríkur Jónsson spoke to restaurateurs who said they had never experienced a similar situation. 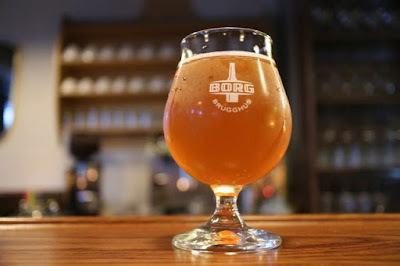 Bar owners who ran out of beer tried to solve the issue by borrowing from bars which were better stocked, while members of the delivery team from Ölgerðin were called out to help the bar owners cope, but "they were fighting an overwhelming force," as Eiríkur puts it. One of the owners of Sæta Svínið told Vísir that the first soldiers came in on Wednesday, the same night as the first ships came to port, and that they stayed until Sunday when the ships left port. With most of the ships and sailors out of port downtown bar owners have managed to restock after the weekend's assault. You always hear these stories about chemists (or insert some other group of scholars here) that hit (that one place in America) and drank all the (insert institutions here) out of (insert alcohol type here.) As you can tell, I'm pretty skeptical of most of these stories, but here's an example where it appears to have actually happened. Well done, Navy, well done, Marines - way to represent the home of the brave and the land of the free. I heard the same thing about a national meeting of funeral directors, in three days they drunk the downtown dry. Undertakers are a lush bunch, its the nature of their business. Drinking helps with putting the fun back into funeral.